sold in the US and expands the brand's line of environmentally conscious vehicles. 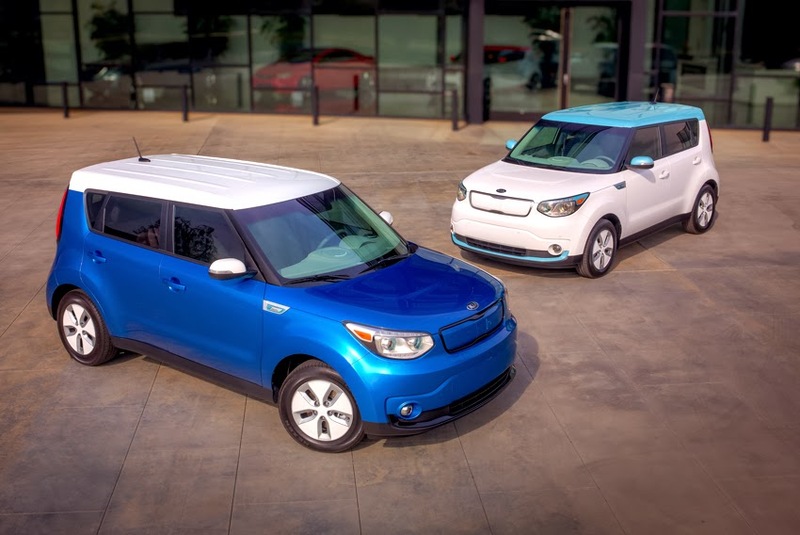 The Soul EV joined the refreshed Optima Hybrid illustrating Kia's intent to lead the industry in providing technologically advanced vehicles that also reduce dependency on non-renewable resources. A top concern for EV buyers has commonly been range anxiety. The Soul EV addresses this issue by utilizing a highly energy-dense lithium-ion polymer battery. Located beneath the floor, the 27 kWh, air-cooled, 200 watt-hour/kg battery is expected to yield a range of approximately 80-100 miles of real-world driving on a full charge, with internal testing and evaluation results exceeding 100 miles in some instances. In an effort to maximize efficiency and range, the Soul EV uses Kia's third-generation regenerative braking system to capture up to 12 per cent of the car's kinetic energy, which is fed back into the battery while the Soul EV is coasting and braking. Soul EV owners can choose between four different regeneration modes - 'Drive' or 'Brakes' modes in Eco-mode 'Off', and 'Drive' or 'Brakes' modes in Eco-mode 'On' (the 'Brakes' setting with Eco-mode 'On' producing the most regeneration). The Soul EV makes charging easy by plugging into any standard 120v outlet or a conventional 240v EV charger. Two charging ports are standard, including a SAE J1772 port for Level 1 and Level 2 AC, and a CHAdeMo DC fast-charging port (480v). Found behind a sliding door located in the front grille, the dual ports offer flexibility and increase the Soul EV's go-anywhere appeal, making it more convenient to charge inside the owner's garage or when on the road. Recharging times vary from 24 hours for a fully depleted battery using a standard 120-volt outlet and under five hours when plugged into a 240-volt outlet. An 80 per cent charge can be achieved in as little as 33 minutes with a 50 kW-output charger. Kia has partnered with three charger providers - Bosch, Leviton and AeroVironmentTM - which give Soul EV buyers an opportunity to select the unit best suited to their in-home needs. The front-wheel drive Soul EV is powered by an 81.4 kW, 109-hp electric motor, producing a generous 210 lb ft of torque. The liquid-cooled AC synchronous permanent magnet motor uses multi-layer magnets to help improve efficiency and reduce the whine that's commonly experienced with other electric vehicles. The motor delivers its power to the front wheels through a single-speed constant-ratio gear reduction unit. Acceleration from 0-60 mph is expected to take fewer than 12 seconds with a top speed electronically limited to approximately 90 mph. The battery's location beneath the floor offers the stable feel of a lower centre of gravity, which helps ride and handling and ensures that the EV remains true to the Soul's fun-to-drive reputation. Additional cross bracing beneath the low-mounted battery contributes to a 5.9 per cent improvement in torsional rigidity over the petrol or diesel-powered Souls. The Soul EV offers plenty of space inside the cabin due to minimal battery intrusion. Because of the battery's flat design and location beneath the floor, there is only a slight 3.1-inch reduction to rear seat leg room (from 39.1- to 36-inches) from the non-EV Soul, yet Soul EV still offers more rear seat leg room than other key EV competitors. Rear shoulder and hip room remain unchanged from the petrol and diesel-powered Souls, making Soul EV one of the roomiest in the segment. Rear luggage space is minimally impacted (reduced 5.1 cu ft to 19.1) as the space under the boot floor is utilised for the battery cooling fan and storage of the standard 120v portable charger. The Soul's bold exterior design is also found on the EV. From the 'floating' roof to the greenhouse that makes the car look like it is wearing wraparound sunglasses, the EV's look is inspired by the 2012 Kia Track'ster concept and retains the iconic square-shouldered broad stance of the original Soul. Initially, the Soul EV will be offered in three colour choices - pearl white lower body with electronic blue roof, caribbean blue lower body with clear white roof, and bright silver with clear white roof. The signature two-tone paint theme is exclusive to the EV and was inspired by a similar treatment seen on the Track'ster. The EV-exclusive front-end features a larger grille to accommodate the charging ports, and other unique exterior Soul EV design features include colour accent trim in the front and rear panels, projector headlights, LED positioning lamps, and LED tail lights. 'Eco Electric' badging replaces the 'Soul' badging found on the diesel and petrol-powered cars, and the Soul EV gets its own set of distinctive 16-inch alloy wheels wrapped with specially engineered Super Low Rolling Resistance (SLRR) tires that offer 10 per cent less resistance than standard low rolling resistance tyres, helping to improve range. The Optima Hybrid builds upon the advancements of the previous version of the car. Debuting with its own exclusive enhancements, including front and rear fascia updates designed to increase aerodynamic efficiency, new wheel designs, and unique grille and lighting elements, the Optima Hybrid improves upon its predecessor. The dynamic and sporty design upgrades on the gasoline-powered 2014 Optima are retooled for the Hybrid to increase fuel efficiency. Contributing to improved aerodynamics is a series of additional vents in the Optima Hybrid's unique front bumper, increasing airflow and reducing drag. Newly designed and more aerodynamic 16- and 17-inch alloy wheels (LX and EX, respectively) reduce weight and drag while superbly integrating with the Optima's eye-catching new design elements. In addition to those elements designed with fuel efficiency in mind, the revised Optima Hybrid also boasts a unique new front grille design, Hybrid-exclusive front LED lighting, new Hybrid badging and an attractive and upscale optional white leather package. There are no plans to bring the Optima Hybrid to the UK market. 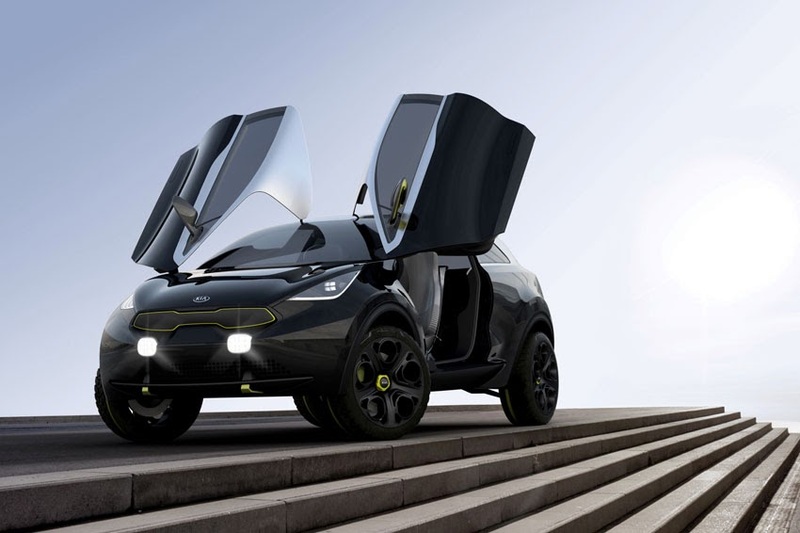 Kia's dramatic and modern Niro urban lifestyle concept vehicle, which was unveiled last September at the Frankfurt Motor Show, made its US debut at the 2014 Chicago Auto Show. The Niro hints at a possible future B-segment contender ready to take on the city environment with style and fun-to-drive attitude, featuring a mix of contrasting materials and compact, purposeful dimensions. The rally raid-like Niro also expands on Kia's alternative propulsion story with its hybrid electric powertrain working through an advanced four-wheel drive system. "Ten years ago people wanted understated style in the SUV market, but increasingly, as more people migrate to the B-segment, they are looking for strong character and individuality," said Gregory Guillaume, Chief Designer, Kia Design Center Europe. "It may have the looks of a Dakar (Rally) contender, but Niro has a strong premium feel thanks to our innovative use of advanced and modern materials that mix brawn with spirit to deliver a playful vehicle ready to be part of anyone's active lifestyle." Although Niro presents a sturdy and muscular outline, it has relatively compact dimensions on its all-new B-segment platform. The design team started with the intention of creating a strong and purposeful outline with a startling two-tone exterior look. Its 164.8-inch overall length, 72.8-inch width and 61.3-inch height place it firmly in the city car bracket. The menacingly dark 'Nightfall' exterior paint is sharply offset by a brushed, stainless-steel roof enveloping the entire cabin. This two-finish construction gives a unique and high-tech edge to Niro's outward appearance. Also adding a feel that the car is virtually bursting out of its skin are running-board-type 'blades' above the lower side-sills - echoed by similar creases in the front and rear lower valances. Furthermore, the concept's firmly planted stance is defined by a 102-inch wheelbase and a 64.2-inch track. Kia's signature grille's outline, front and rear tow hooks, hood-mounted air outlet, and other exterior elements are highlighted in anodized 'Limelight' aluminum and lend to the Niro's impressive road presence. The front valance also features an asymmetric arrangement of air vents that were first seen on the Provo concept in Geneva last year. The aggressive-looking front fascia is enhanced by an ice-cube headlight arrangement, strip-styled daytime running lights around the outside edge of the headlight housing, as well as built-in quartered spot lights. Entry into the vehicle is by way of dihedral 'butterfly' doors with flush door handles, that swing up high into the roof. Mounted directly onto the side windows are milled 'Plexiglas 1' door mirrors with built-in cameras. And at the rear, the large hatch opens to reveal an expansive carbon-fiber-clad cargo deck ready to swallow large quantities of equipment, gadgets, gear or luggage. Part of the rear light cluster swings up as an essential element of the hatch architecture to give good light and visibility into the cargo space, leaving behind the secondary section of the cluster to enhance safety by ensuring others on the road can still see the car in the dark. The Niro's powerful physique sits atop large 225/40R-20 tires mounted on milled-aluminum 20-inch five-spoke wheels. The Niro continues its futuristic and tech-savvy theme within its 2+2 interior. Easy entry and exit are ensured by the butterfly doors which reveal a voluminous cabin defined by luxury touches and high-quality materials. Niro's molded one-piece front seats are covered in an 'Orbit Silver' line-quilted fabric. The clam-shell seatbacks tilt forward to allow access to a two-seat 50/50 split bench seat. These rear seats allow Niro to accommodate two extra passengers, but when folded flat they form the front edge of a useful, full-length carbon fiber load area. Extensive use of 'Volcano Black' leather on the front dashboard coupled with switchgear finished in either anodized black or 'Limelight' aluminum give the interior an upscale and sophisticated feel. For the driver, a perfect seating position is found thanks to the fully adjustable pedals and the deep-dished aluminum and leather steering wheel. Ahead is a Supervision digital instrument cluster. Additional information - such as altitude, Bluetooth 2 functions and satellite navigation - is displayed on a center console-mounted screen. This screen also allows the driver to see and record live pictures from video cameras mounted at the front, rear, sides and within the vehicle. Niro may be a designers' eye view of a future B-segment contender, but that doesn't mean it is a pure flight of fancy. This concept comes with a variant of Kia's turbocharged 1.6-liter 'Gamma' engine, capable of 160 smile-inducing horsepower. The engine and a seven-speed, dual-clutch transmission serve the front wheels while an electric hybrid system powered by regenerative braking delivers up to 45 horsepower to the rear wheels - when road conditions require extra grip.